TIGG was founded in 1977 to provide small activated carbon modular adsorbers for the emerging pollution control market. As the business began to grow, the company began to manufacture larger vessels for both activated carbon and multimedia applications. Now after nearly 40 years, TIGG has the experience in developing a broad range of activated carbon filters, activated carbon adsorption equipment, systems, and services for environmental remediation and the removal of trace contaminants from air, water, and process liquids, and gases. In addition to activated carbon equipment, TIGG designs and manufactures integrated liquid and vapor treatment systems and provides a variety of services including equipment rental programs and media change outs. In 2009, TIGG acquired a 155,000 square foot manufacturing plant situated on 40 acres of property in Heber Springs, Arkansas. After upgrades and modifications, the ASME code shop is outfitted with state-of-the-art equipment allowing TIGG the ability to manufacture steel tanks and pressure vessels up to 14 feet in diameter. At our Heber Springs plant, we produce more than 60 standard modular activated carbon adsorbers which can be filled with a tailored media to meet your specifications. At TIGG, we take a comprehensive approach to help you meet your treatment objectives. 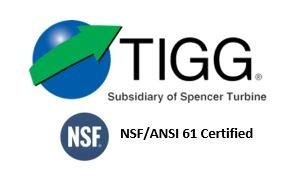 In November 2014, TIGG was acquired by the Spencer Turbine Company. The synergy between the two companies will position them both to offer expanded products and service to their clients. TIGG has 40 years of experience developing a broad range of activated carbon filters, activated carbon adsorption equipment, systems, and services for environmental remediation and the removal of trace contaminants from air, water, process liquids, and gases. We proactively seek out the needs of the environmental market for removal of trace contaminants from air and water. We respond by offering a comprehensive line of cost-effective, technically-sound products and services delivered by the most competent professionals in our industry. We concentrate on working with engineering firms, contractors, and end users in the environmental market in geographic areas where we can develop a competitive advantage. We strive to develop long-term relationships with our customers as their preferred source of treatment solutions for environmental applications.